White solid timber frame with rough sawn natural stained timber feature on the top. All drawers come with metal extension runners. NOOSA made from solid Acacia hardwood timbers. Featuring 3 different textured panels show casing contrasting colours or finishes. Drawers have metal extension runners. Provides a lasting and solid furniture choice. Its rustic charm is only matched by its quality and will make a fine addition to your home. DEVON - Classic style never gets dated. Constructed from solid timber and finished in a dark natural timber stain. DROVER - This is a timeless traditional look. Constructed from solid timber with rustic blackwood finish. 2000W x 430D x 1980H. 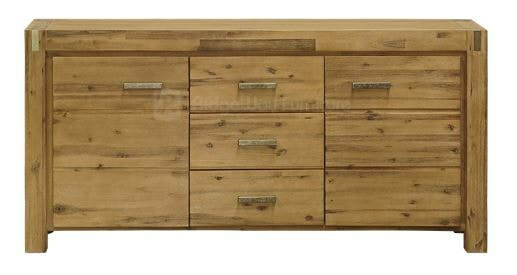 Trend Buffet Range - Dark Grey painted frame, with reclaimed timber drawer fronts and brushed metal handle. Full extension metal runners.